The Falconer takes place a year after eighteen year old Aileana Kameron witnessed the murder of her beloved mother at the hands of a fae. Now, while trying to come across as a perfect lady who would make a wonderful wife to any eligible bachelor, she hunts the fae with the hope of avenging her mother. Those of you who've been following my blog for a while will know that I love me some historical fiction. Add in a dash of speculative fiction - magic; mythology; folklore; fairy tales - and I salivate. Needless to say, The Falconer has been on my radar for a long while, particularly as I follow Elizabeth May on Twitter and love her tweets. I've sat back and watched her glorious feminist rants many a time, so I was very excited to read some of her fiction despite the mixed reviews I'd heard from other people who'd read the book. If anything, their opinions just made me more curious about what my own might be. After receiving an eARC of The Vanishing Throne, the second book in this trilogy, I thought it was about time I read The Falconer, which I actually bought back in January and just hadn't gotten around to because I'm rubbish. So I finally picked it up! And...? And to be honest, now that I've read it I can understand the mixed reviews, because what follows is a mixed review of my own. First thing's first: this book is very fun, very fast-paced and so easy to read. In fact I'd recommend this book to anyone who's a little intimidated by historical fiction because this book is proof that historical fiction isn't boring. As a big history nut I don't mind the slower reads, but I'm not about to recommend something like Jonathan Strange & Mr Norrell, which is over 1,000 pages long and has footnotes, to someone whose palms begin to sweat at the thought of reading historical fiction. 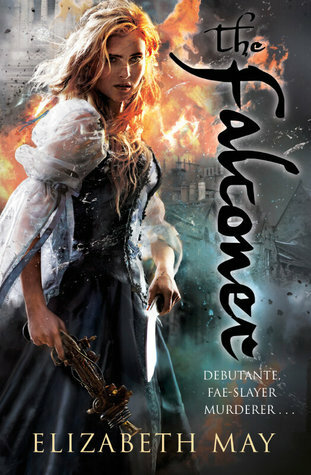 The Falconer isn't actually straight historical fiction; there are elements of steampunk and alternate history in it, so I think any readers who are fans of Gail Carriger's work would probably enjoy this, particularly fans of her Finishing School series. When I first realised this book was also steampunk I worried that the historical accuracy would slip, but I think Elizabeth May did a fairly good job of reminding me of the time period we were in; I would have liked a little more history, though, that was more than just 'oh good gracious me the neighbours saw my ankle how shall I ever show my face at the next tea party?'. I'm all for societal and marital politics - life was hard for women in the 19th century just as it was for them in any other century, because they had to be so accomplished and yet also so demure - but I didn't feel like I was reading anything new when Aileana was thinking about how limited her future was because she's a woman. That's not to say her feelings aren't valid or they shouldn't have been there, but it would have been nice to have seen it explored in a different way. Does that make any sense? One thing I must say is that this book pleasantly surprised me with the complete lack of a love triangle, something which I've become so fed up with seeing in speculative YA fiction trilogies. I'm hoping this is a trend that continues throughout the next two books in the trilogy, because love triangles are just boring unless they're done well, and they're very, very rarely done well. Having said that, there were still parts of the book that felt a little clichéd; Aileana's beautiful and intelligent and rich and kickass. I don't like to say that a character can't do all of these things - I'm still not sure if I like the term 'mary-sue' because I feel as though many of the qualities that make a heroine a mary-sue wouldn't make us bat an eyelid if it were a male protagonist who possessed them - I'd just like to see some plainer main characters in YA. And by that I mean characters who are actually plain and don't suddenly become stunningly beautiful when they take off their glasses or brush their hair. Similarly Kiaran, a fae who's been teaching Aileana how to slaughter his kind, is described as beautiful as the men in YA often are. In other words I lost count of the amount of times I came across a description of his eyes. I did quite like Kiaran, though, but I suppose that's mainly because I have a fondness for characters who are sarcastic. Personally I wanted more of Catherine, Aileana's best friend whose older brother, Gavin, was the character I feared was going to turn the book into another love triangle book. Considering Catherine is Aileana's closest friend I felt as though I didn't see enough of her, in fact Aileana spent most of the novel with a bunch of men which I was a little bit disappointed with. I understand that men had more freedom back then and, in the book's defence, two of the men she sees most often aren't actually human, but if Aileana can defy society's expectations why can't some of the other women do the same? The most important relationship Aileana has is with her deceased mother, whose gruesome death still haunts her and whom she still misses dearly. That I can totally understand, and if I were in Aileana's shoes I'd want revenge, too - plus her mother seems to have been a very keen astronomer and sounded like a generally cool lady - but I started to get a little tired of hearing how desperate for revenge Aileana is. I felt as though I was being reminded every two seconds how all Aileana lived for was revenge and, dammit, I get it. Can we please talk about something else other than your unquenchable thirst for revenge? In fact Aileana began to annoy me a little at the end of the novel. I'm not going to spoil anything, but some of the decisions she made were infuriating because if she'd just concentrated on what she was doing things would have turned out very differently. I'm intrigued to see what happens in the next book, though. The Falconer certainly feels like the build-up to whatever's going to happen in The Vanishing Throne, but it's a really fun read and even though it's not the best thing I've ever read I did enjoy it, and I'm looking forward to reading more of May's work in future. I've never really read any books about the fae, so this was a nice change; I liked how May incorporated the folklore into her story, and I definitely got the sense that this was a novel she poured her heart and soul into creating because her love for the ties between Scotland and the fae is so clear. Is it a mind-blowingly excellent masterpiece of brilliance? No, but it's a lot of fun and this trilogy has a lot of potential. I do think it's worth reading, especially if you're in the mood for something to whisk you away somewhere completely different where there's a lot of fun to be had. :D Thanks for reading and commenting, Micheline!